This functionality has been a long time coming. Everyone has the person playing on their team that shows up to one game and has the best game of their life. From that point on, they appear at the top of their stats because they have the best averages on the team. Since stats like this don't significantly prove that these players are indeed having the best season, there is new functionality introduced today that will drop these players to the bottom of the stats. To setup the percentage of games a player must play for their stats to be significant, you will have to head on over to the "Edit Team" page. 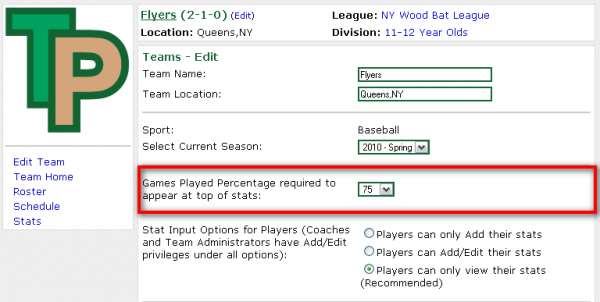 There is a field called "Games played percentage required to appear at top of stats". You can set this field to any value from 0 to 100 in 5 percent increments. By default, the site will set this value to 25%. Take a look at this example below. We have set the stat percentage to 75%. In this example our team has played 4 games already so a player will have to have played in at least 3 of them to appear at the top of the stats list. The GP column for each player is divided by the GP for the team to calculate the percentage of games played per player. When this percentage is being used you will see a line going through the middle of the stats so you can easily tell which stats are significant and which aren't. Notice how "John Trava" didn't play the required 75% of the games so his stats drop to the bottom even though he has the best batting average on the team.